Home › Home and Kitchen › Lebice Popsicle Molds - Bpa Free - Homemade Ice Pop Maker - Drip Guard And Tr..
Lebice Popsicle Molds - Bpa Free - Homemade Ice Pop Maker - Drip Guard And Tr.. CAREFULLY THOUGHT-OUT! We have invested a lot of thought in ensuring that the Popsicles are easy to remove and that they stand stably inside the freezer. We made sure it would fit perfectly inside most of the freezers. Carefully read the instructions inside the box and we are sure you will make the most out of "Lebice Popsicle molds" this summer. NO MORE MESS! 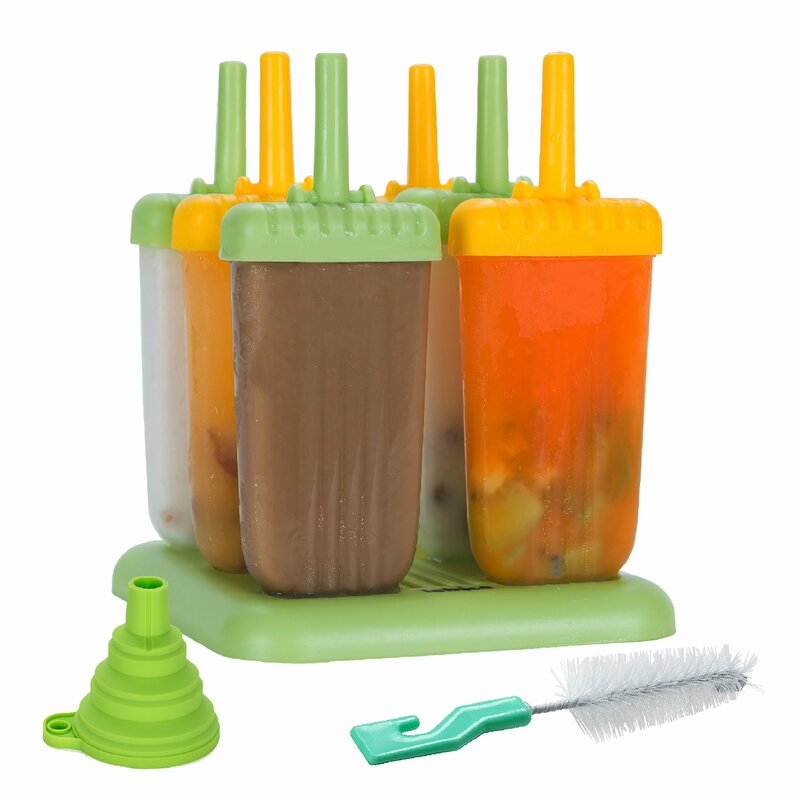 These 6 Popsicle makers have a drip tray at the base of each one that will keep your kids clean and without sticky fingers, thanks to a carefully designed handle for them to hold. 100% BPA FREE & DISHWASHER SAFE, FDA APPROVED! Because for us, your health is the most important requirement. This feature also helps reduce waste with an eco-friendly, reusable design. It can be used over and over again to make all-natural frozen treats such as juices, yogurt with fruit and anything you like. LIFETIME GUARANTEE! If you ever experience a problem with our Popsicle maker, we will replace it with a completely new Popsicle mold. If you don't love this product, return it at any time for a 100% no-hassle refund. With this no-risk guarantee, simply add one to your cart now and you'll have Popsicles in your freezer in no time! WHO EVER HEARD OF A WOMAN LOSING WEIGHT, AND ENJOYING DELICIOUS SNACKS AT THE SAME TIME! Have you been looking for a snack with fewer calories?Something more natural? Are you willing to give your kids more fun for less money? Do you want to stay comfortable without over-working? You can make DELICIOUS snacks in different flavors without gaining weight at all! You can give your children healthy popsicles that they will have a lot of fun with. Your kitchen will stay clean and tidy, thanks to a funnel and a brush you will get to make cleaning the mold easy, and the mold can be used again. Why use Lebice popsicle maker? It was a Thursday afternoon in the middle of the summer and I was exhaustedfrom a busy week that was finally coming to an end., Coming home I found my daughter Jenny in the garden. She was sweating and wasdefinitely not in a good mood. I thought to myself, "How can I make her feel like she's sitting in the mountains breathing in cool, fresh air?" Wow, how could I have forgotten? Ready in the freezer I had some LebicePopsicles that I'd put in last night for exactly that! I got up and hurried tothe freezer, getting out the ever-refreshing kiwi and pineapple flavors. We got on the swings in the garden and enjoyed the summer as if we were in the mountains! &star; These Popsicles are the best size that I've found. Great for adults andfun for kids who can use the funnel attached! A cheap and healthy treat. Lebice helps me get through the summer a lot moreeasily! Lebice promises 100% MONEY BACK GUARANTEE! We guarantee a FULL refund if you are not satisfied with our products. Lifetime warranty for any issues you experience. completely RISK-FREE, buywith full confidence. Just press the yellow "Put in my cart" button and order now.